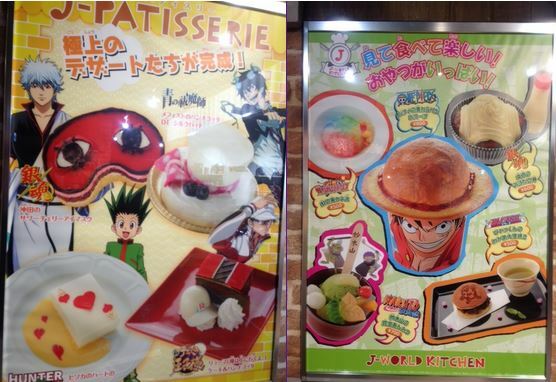 There I am at J-World, the new mini-anime theme park at the Sunshine City building in Ikebukuro, Tokyo. I like anime and manga, I’m staying in Ikebukuro for a month, I’m a 3 minute walk away from Sunshine city, and I see a sign for it every time I walk towards the train station. So I buy a ticket for 1300 Yen which includes an exciting free drink pass. 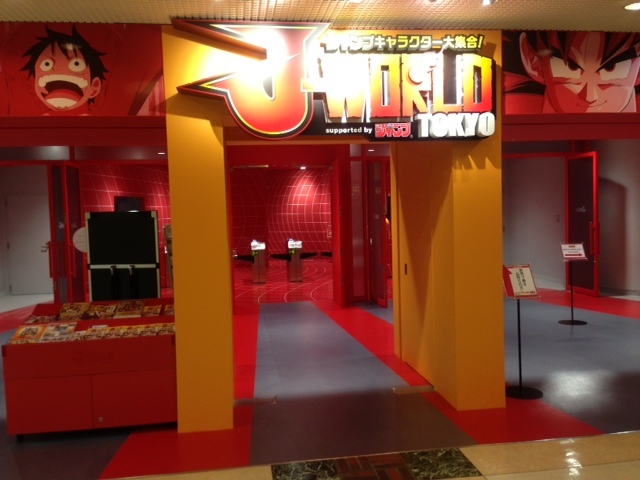 I was thinking of reviewing J-World, that just opened in July 2013, but as I was walking around the empty floor with staff dressed as various anime characters, probably wondering when they will lose their 900 yen/hour jobs, I was extremely unimpressed. There were expensive ride-experiences (like shooting a fake kamehameha for 800 yen), photo pose spots, and lots and lots of merchandising. But overall, lackluster. I like anime? Why was this all so boring? To take a moment to reflect, I used my free drink pass at the cafeteria which had some strange anime themed foods, and sat down to type a JALUP article (that’s what I do in public places). I overheard a conversation near me discussing Otaku. And I got stuck on a simple thought. Are people who simply like anime and manga considered Otaku? Is there a single meaning of Otaku? What the hell is Otaku? For those smart word-wizards out there, you probably want to add in that お宅 (spelled like this), originally was a polite way of referring to someone, their home, family, husband, or company. But that’s not what we are here for. We are here for the often misunderstood word. The word “Otaku” has now been used in the West for a number of years. As with all borrowed words, they sometimes take on a slightly different meaning when they move between languages. It is often used to refer to fans specifically of anime and manga and is directly translated as nerd, geek, mania, obsession, fan, etc. The Wiki article in Japanese covering the word is much more in depth at 5+ pages. The term originated in the 1970s as a way of referring to a subculture fan (specifically anime and science fiction fans, which at the time were considered subculture). In the 1990s, some of it’s negative connotations disappeared, and it referred to someone who was very into a specific hobby. Now it covers fans of anything, and is often referred to someone who is very engaged in something, possibly to the level of obsession. It is often connected with Akihabara and “Moe” culture. Originally used in the mid-80s by friends with each other to refer to someone who was very informed about a specific subject. Eventually used as a light derogatory term to show someone who lacked common sense and social skills. But really, there is no set standard for the word. You can argue about the real meaning all you want, but there is no agreement, no consensus on what the word actually really is. It’s a subjective word. Depending on who says it to who, where, and in what context, the meaning changes. The feeling changes. The word Otaku looks like it could easily be compared to “fan,” “expert,” “mania” or even “scholar.” What shows the distinction is what the person is specifically involved in. These words are used for what society considers more important and valuable hobbies, with the reasoning behind those hobbies understood. Japanese Wiki provides examples of a stamp collector or scholar who is a dinosaur researcher as being socially acceptable, and thus a positive image attached. What comes to mind is Indy from Indiana Jones or Dr. Alan Grant from Jurassic Park. For hobbies that are out of the norm, Otaku is used instead. So Doc Brown from Back to the future had an unhealthy obsession with time travel, so he wouldn’t be considered a scholar. Does this make sense? I don’t agree with this, because social norms are constantly changing. When I was growing up, kids who played video games were looked down upon. Now they are not. What is a normal hobby? What is doing something more than a normal person does? Why is this bad? I mean, stamp collecting? Strange choice for a “normal” hobby in 2013. 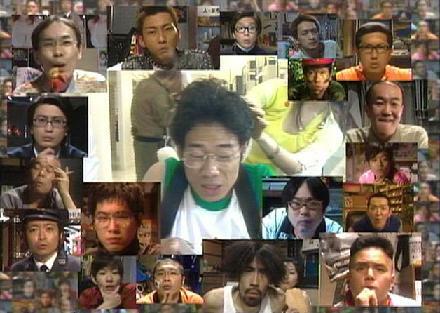 Otaku is often thought of as being very engaged in a subculture. But at the same time it is also considered its own subculture. Which is why you can say someone looks like an Otaku or speaks like an Otaku. Some people like being called an Otaku. Some people don’t. Some people don’t know why they are called an Otaku, or whether they should be. Some throw the word around lightly. Others avoid it. Ask yourself this: do you like anime, manga, or video games? Does this make you an Otaku? Often, when Japanese hear that a foreigner likes any of these three, they think Otaku, and may even use the word jokingly to them (I believe without the negative implications). How do you react if you were called an Otaku by someone Japanese? I get confused when Japanese people joke around with the word Otaku when they find out I like anime/manga. If this were the prerequisite of being an Otaku, a large percentage of Japan would be Otaku. Am I an anime/manga fan? Yes, I like watching anime and reading manga. But Otaku? To me the word has too much baggage and over broad nature. If you are using the same word to describe me (who likes watching anime) and Takeshi (who has hundreds of dvds, anime figurines, cosplay costumes, and often frequents maid cafes/conventions), there is a huge gap. What do you all think of the word Otaku? Do you consider yourself to be an Otaku? Have you ever been called it? Have you used it on other people? How do you perceive it? Does it bother you? The only times I have heard the word Otaku used by Japanese people is through listening to my wife speak to her sister or co-workers. In every situation the same sentence usually included words like “yabai” and “kimochiwarui” coupled with laughter, so for me at least it only has a negative vibe. I also said to my wife once that I thought Otaku just meant people who are really into anime, manga, collecting models and the like. But she said there is also another usage that she couldn’t explain. I watch plenty of anime, but she said I am not considered “Otaku” apparently. My feeling is that it can also be used to say something similar to “loser” but it is just based on my limited observations. Tell your Japanese wife thanks for contributing her opinion. It’s really interesting to see that some Japanese have this terribly negative image of the word while others throw it around playfully. From me a half Japanese and half Caucasian girl , my family doesnt really like to refer to people who like anime or anything like that as “otaku” we take it as offensive. If I were called an otaku about how much I loved manga in Japan, I would like it. It would show the fact that I like manga so much is showing to others. Does that make sense? I think it’s cute. However, I’ve never been called an otaku. However, if I were ever called a weeaboo, I would be offended. I feel like that is the equivalent in America to being called an otaku in Japan. 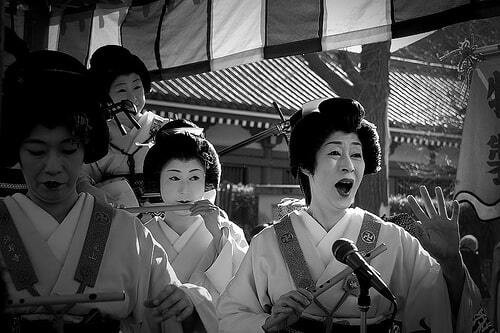 The term gives the impression that liking Japan too much is a bad thing, and I find it insulting. I haven’t heard it much really, but have seen it used on forums before. I don’t consider myself an otaku in the American sense, because my association of people who call themselves otaku in America really love anime but don’t really care for the country that’s making the anime. Therefore, I avoid calling myself an otaku in America. Just a side note for anyone who wants to read more about the topic of otaku, I would recommend Ian Condry’s book The Soul of Anime. We read it in my Japanese culture course and it was very interesting. It talked about the collective energy of otaku and the existence of bad (such as violence and sexual harassment) and good otaku. It also is filled with interviews and stories from anime studios and directors, which is interesting for any anime fan. I especially loved the part about Hosoda Mamoru. I think it might also depend who called you it and in what context. Thanks for the info about the book on Anime. Looks like a very interesting read for people who are more curious about this subject! “Weeaboo” doesn’t mean that a person likes Japan to much (I would think that that would make them a Japanophile), it means that they’re obsessed with Japan BUT totally ignorant about its culture outside of anime/manga/j-dramas/j-pop. I was Japanophile but that changed for me as I found myself taking interest in other cultures and countries.I think that now I could travel to several countries instead of just wanting to be an animator but to express myself in arts other than visual arts. I found this article quite interesting, I’ve never given it much thought and I’m sure most haven’t. And I consider myself one. I think the word is rather negative or should be used as such mostly because. I am not an Otaku because I want to be, I find it hard to socialize in pretty much anyway except on the internet and so I escape into anime, manga, video games, anything to escape reality even if it’s just for a bit. (Being as I don’t socialize with anyone I’ve never really been called one.) Either way despite being five months after the post I would like to thank you, I found it entertaining. It’s interesting because some people who love anime, manga, and video games really like to socialize (go to anime conventions, cosplay, join manga reading groups, etc). While others prefer to enjoy anime, manga, and video games alone at home. So there is a bit of a divide. This is pretty interesting and I think almost totally captures my opinion. Here’s how it goes for me: Otaku can be slightly negative in Japan, but it’s pretty much a slightly stronger version of geek or maybe something like gamer freak. It’s really not that derogatory, and I like to identify as otaku. It’s definitely not just liking or watching anime and such–as you said, there are huge gaps in devotion. I’ve watched around 300 animes and countless manga, manhua, manhwa, and etc. I also have a PSVita with tons of Jap-anime-esque games, around 500 dollars worth. I’ve got limited edition items from the biggets otaku kon, Kameket, and plenty more. I consider my brother and I definite otakus. The key differenciation is experience–weeaboos are not only obsessed, they constantly try flaunting their knowledge and ACTING like otakus–except they have very little actual credibility and understanding of the otaku community. Sorry for that long comment, lol. I’m just tired of weebs constantly trying to scream “OTAKU is actually a horrible derogatory term in Japan! Wawawaaaah!” But really, I’m quite sure Japan is fine. As you said, depends on the situation and type. It’s like lumping a bunch of people that meet certain criteria together–we all go about it different ways and are different kinds of people. It’s not meant to be a stereotype; the only thing we should all have in common is a huge love for anime and etc. Thanks for adding your opinion! I agree that trying to lump people based on an ambiguous set of criteria is what creates such an amorphous word. Personally, if someone called me an otaku, I’d be highly offended. Why? Well the reason behind this is that the true, full, meaning of otaku is a person who shields off the world from them and rarely goes outside or makes any social interactions. Otakus are afraid of talking to people and are commonly known for obsessing over manga or anime. I’m a fangirl, and I know for a fact fangirls exaggerate a lot. And I mean a LOT. For example, we say obsess, when we mean have a huge interest in. The real definition of obsess is, devote your whole flippin life to it- if it dies, we die too. And that’s how fangirls feel. I know that. But unfortunately, we’re not being 100% literal. An example of obsess can be loving someone too much, that you want to kill yourself or that person. Bloody kill. KILL. It’s THAT serious. But it’s not always killing. Sometimes, it’s much, much, much worse. I forgot to write; Otaku is derived from the japanese word ‘taku’ which means house. If you don’t believe my definition, search it up in either dictionary.com or the urban dictionary. You’re really citing urban dictionary as a source? To be fair, urban dictionary is a great resource, even if it’s not trustworthy to an “academic” degree. Even Adam’s post points out the connection to 「お宅」. That said, I have to challenge the assertion that any word has a “true” meaning, especially one as tricky as this one. Words change in meaning over time, and furthermore have different meanings to different people. Context is extremely important. When I was in school, the word “geek” was a major insult. “Geeks” were at the bottom of the social totem pole, and suffered all kinds of harassment and cruelty. But now? My office prints “geek” on banners and hangs them up on the walls, proudly. The label has become a badge of honor. No dictionary definition or “original” meaning can take that away from us. At least in English, many people have adopted the word “Otaku” as a positive label in a similar way. Even in Japanese, I’ve rarely seen it used as anything worse than a light-hearted jab. It seems to carry about as much harshness as “computer nerd” or “sports nut”. Of course there are examples of it being used in a more nasty way, but again it’s all about the context. I’ve never taken offence to being called an Otaku. I refer myself as an otaku because I do love anime a lot and I’ve always been fascinated by Japanese culture. Though a lot of the time on Facebook, there are arguments that say your only an otaku if you’ve seen a lot of different genres of anime. The common one I see is “just because you like bleach, naruto, and one piece doesn’t mean your an Otaku. ” Another argument I see is otaku vs weeaboo. Otaku’s are said to be more of the hobbyist were as the weeaboo is the super obsessive one. Either way, if you like something you shouldn’t be afraid to show it. Though as stated in one comment, being a geek is acceptable now. I’d like to identity as an otaku, but I’m not sure if I qualify as one. I mean, I spend the majority of my time watching anime and reading manga online, like, to the point where I would often sleep at 3:30 AM. But, I never bought anything because I’m a huge money saver. So, no figurines, DVDs, etc. But, yes, otaku is generally positive in America; weaboos are negative. In my personal opinion, I think both kinds of people are obsessive, it’s just that otakus keep to themselves, while weeaboos like to flaunt their knowledge, act like huge know-it-alls, and they’re the kind of people to add a bit of Japanese in their every sentence. Often they’re portrayed as negative, because oftentimes, although they obsess over Japan, they’re not as informed as they’d like to show. Meaning: Obsessed people that oftentimes add Japanese words to the back of their sentences, but in reality, don’t know as much as they’d like to show about Japan. I typed in google translate the word otaku and it was instantly translated to ‘geek’ without any relating words. Just like most people on here, I would be happy to be called otaku because I don’t see it to be a shameful thing. Of course, I say this with a western understanding/upbringing so I wasn’t exposed to be bullied about my interest. My love for anime started a few years back but I didn’t really care to know about the background information of the programs a watched, until recent. I’m basing my project on the subject of otaku I wanted to get more information of experience you guys. I remember spending a week with a friend in California, where we were watching Kaizoku Sentai Gokaiger, and my friend’s boyfriend made some comment that I corrected, something about Japan that was wrong and probably offensive. Anyways, I got called a weeaboo; I remember being so mad just for knowing something that he didn’t that I had to remove myself from the room before I decked him in face. I can live with being called an Otaku, I love and enjoy Anime, I had since I was old enough to even understand it, but being called a weaboo in terms of being ‘obsessed with Japanese culture’ is a little uncalled for. Yeah I definitely get what you mean. The term Otaku can be both negative or positive depending on the person and how it is being said. The term weeaboo however, annoys me greatly. I have seen people say that about another person because of their knowledge of the Japanese culture. I also do not like when people call someone that because they use Japanese words in their sentences. Nobody has called me one but if they did I would throw them into the sun >_>. Because I use a plethora of Japanese words in my sentences and even speak in Japanese because that is the language I wish to become fluent in. People like to think “Oh you like Japan…weeaboo” and it is uncalled for. To love a certain culture and wish to partake in that is a good thing. Just like someone trying to learn any other language or culture. I gotta be honest and say I’ve actually never had a Japanese person call me otaku before. I call myself otaku but that’s neither here nor there. I’ve had Japanese call me fujyoshi but definitely not otaku. I watch a ton of anime and read a ton of manga don’t know if I would be called a otaku, but I really don’t like talking to people I shield my self from the real world and watch anime and read manga. Once people find out they constantly teased me about it, it just really harsh to tell people that since I’m a girl it gets worse, when I do talk it’s about anime I want to meet people that have the same interest as me with anime and manga but I’ve only found boys which is fine but still. Sorry if what ever I said did not make sense. An otaku despite what the article says isn’t healthy, or positive. It’s not like nerd or geek, it’s more or less an insult meaning to have an unhealthy obsession with something that i consumes your life with it. It’s not just anime/manga related either it can be anything shoes, music, etc. There are a lot of females that are into anime/manga but because they’re girls and most guys into it aren’t exactly socially awkward tend to drool over the slightest hint of a female being into anime/manga, the majority of them tend to remain silent about being female. Being teased is something that happens a lot, because people tend to go around shouting phrases from anime, cosplay when not at a convention or the likes, use Japanese words in lieu of their own language or whatever a lot of people have developed a hatred of the fandom. Not sure if you still check this page, but I really appreciated the article. Even though the exact definition of the word may be elusive, subjective, and changes through a range of social contexts, your thoughts really do help to clarify things quite a bit. I got in to anime because my kids loved it, and I watched a few series in order to spend time with them. Ironically, I was the one who became addicted! Now my own children (now teens) laugh at me and call me an Otaku. However, I have never found it offensive. They are great kids, and they say it to tease me and give me a hard time, but they also say it with fondness. They still watch anime with me when they can take time away from their busy sports/academic/gaming schedules. If someone else called me an Otaku? I doubt I would take offense then either, unless it was very clearly said with disdain. After all, I have been affectionately called a nerd all my life (which is totally true btw), and it has never stopped me from having great friends, a near-perfect wife and kids, a great career as a physician, etc. I say love what you do, own it, and realize that most people are not trying to insult so much as they are being playful and trying to make a connection with you. Offense/insult is too often perceived where none is intended. Not always true of course, but you will be happier overall if you give people the benefit of the doubt. Incidentally, we are planning a trip to Japan next year. If someone calls me an Otaku there, I’ll let you know if it changes my perceptions… but I doubt it. Thanks again for the article. Great stuff and very helpful! Thanks for sharing your thoughts on the word. You bring up a great point, that the way it’s used, who it is used by, and the intention behind it can also add to how it is perceived. I really like anime, manga, and am quite taken in by the Japanese culture. However, I never considered myself an otaku or weeaboo. But, here in America, individuality is accepted and encouraged and, an interest, even a little out of mainstream isn’t a big deal. The connotation seems to imply an unhealthy interest level that eclipses everything else. The obsession takes up so much money and time, leaving the person awkward and socially immature=very, very much like the days of Dungeons and Dragons and later the video game culture. Interestingly, I just finished watching an anime about an otaku in “Kiss Him, Not Me!” where girl who is nothing short of rabid otaku, in an accidental twist, becomes the new “hot” girl-and is too immature and socially awkward to deal with the newfound male attention. So, am I an otaku? Doubtful. Possibly. But I’m not going to overly stress about it-I like what I like and that’s about it. So my new girlfriend called me an Otaku recently with a smile, and I started digging into the term. I do have a social life, I just like hardware computers and my 3 boys (all adults) are crazy gamers. So I watched Japanology Akihabara on you tube with Peter Barakan and the Akihabara expert described 4 or five types of Otaku, Hardware Otaku, Software Otaku, Anime Otake and Manga Otaku. Whether negative or positive depends on setting, who you are talking about, are they present? I laugh when I hear it, and then decide I need to clean out my old hardware and stay focused on just the current hardware.